On the 20th February 2016, in one of the most divisive and dangerous political moves this century, the then Prime Minister David Cameron announced that the British public would vote on if the United Kingdom should remain a member of the European Union – and the effect of Brexit on the NHS has been a hot topic. On 24th June, following that referendum, Britain declared that it would be leaving the EU. The process of the split is ongoing, and the effect it will have on healthcare and scientific research in the UK is still, for the most part, uncertain. How much do you know about the NHS? Take the quiz! In January 2019, Prime Minister Theresa May’s Brexit deal was rejected by MPs by 432 votes to 202 – the largest defeat for a sitting government in history. Although the UK is still due to leave the EU on 29th March, this defeat leaves the nature of the terms of Brexit unclear. Labour leader Jeremy Corbyn called a vote of no confidence, which May won by 325 votes to 306. However, there are still divisions within the Conservative party over the way forward with Brexit. Following discussions with MPs, May’s new Brexit plan was published on 21st January, with a full debate and key vote on that plan to take place on 29th January. MPs are putting forward plans to change the outcome of Brexit ahead of the vote on May’s amended deal. So – what are the concerns for the NHS if Brexit goes ahead? NHS Brexit: Are Patients Stockpiling Drugs? The Royal College of Physicians has urged the government to be more ‘transparent about national stockpiles, particularly for things that are already in short supply or need refrigeration, such as insulin’. In January 2019 The Guardian found evidence that some patients had been stockpiling certain medicines by ordering them from abroad. Professor Helen Stokes-Lampard, the chair of the Royal College of GPs, said: ‘We … would ask them [patients] not to take it upon themselves to stockpile, or put their prescribing healthcare professional in a difficult position by asking them to help them to do so, and look to the government to reassure the public’. Pharmacists have also been told by the NHS that plans have been drawn for the use of alternative transport routes and prioritisation of medicines as part of contingency planning for a no-deal Brexit. NHS Brexit: What Does This Mean for the Economy? One of the major ‘NHS Brexit’ questions is the issue of the economy. If there is one move on the Leave campaign’s side that could be said to have swayed the public’s opinion, it was the erroneous claim that leaving the EU would free up £350m per week to be spent on the NHS. The cross-party campaign couldn’t dictate how any funds were to be spent, nor had they quoted an accurate figure. The Financial Times calculated the UK’s contribution to the EU as £137m per week and predicted that the bulk of the so-called savings would be distributed amongst a variety of public sectors – and used to pay for the lengthy settlement with the EU itself. The current prime minister has expressed that the UK will not remain in the customs union under any circumstances. This may lead to border disruptions and delays, jeopardising pharmaceutical supply chains and affecting a large proportion of medication such as radioisotopes for treating cancer and insulin for diabetes. As a solution, the government is looking to stockpile medicines. However, the act of stockpiling drugs itself will cost the NHS millions of pounds instead of improving its funding. The government has recently promised a £20 billion raise to the NHS budget per year for the next five years. However, this will only start to take effect in 2019, with some suggesting that this will lead to a very dangerous 2018 winter season for the NHS. The Health Secretary says that he remains hopeful that the health service will be able to cope. Stricter immigration laws, such as the new “settled status” for EU citizens, may also slow the UK’s population growth, and “Leave” campaigners argue that the fewer people who are eligible to access NHS services, the greater the government spend per capita. NHS Brexit: What Does This Mean for the NHS’ Staffing Crisis? Another question raised by the NHS Brexit issue is the staffing crisis. Since the result of the referendum, the number of European Economic Area (EEA) staff who have left the Nursing and Midwifery Council has tripled, with nearly 4,000 staff leaving between 2017 and 2018 alone. However, within the same time frame, only 805 members registered with the NMC, which is just 13% of the 6,382 staff that entered the UK in 2016-17. Despite currently having over 60,000 European workers in the NHS already, the lack of new migrant workers has left the NHS with a real terms loss of 40,000 nurses. The number of European workers in the NHS is expected to fall further once Britain fully leaves the European Union, when harsher immigration laws are implemented, the value of sterling and UK salaries decrease, and the recent “seven day NHS” initiative deters EU staff from signing up for longer hours. Conversely, there is also a worry that UK expatriates, of whom 430,000 are over 50, will lose their right as EU citizens and return, increasing the burden of an already ageing population on an already struggling health service. NHS Brexit: What Does This Mean For Scientific Research? Another issue raised by NHS Brexit is the impact on scientific research if the UK is unable to retain its EU funding. Between 2007 and 2013, the UK contributed €5.4bn to the European science budget but received over €8.8bn – a €3.4bn EU-sourced surplus far from the pro-independent rhetoric of the Leave campaign. According to university officials, an additional €1.4 billion has been allocated since then – the equivalent to another Research Council – and the UK has received 22% of all allocated EU scientific research funds since 2007. The British Council has also calculated that 11% of UK university research funding comes from EU sources, excluding the significant income generated by EU student fees. Whilst the financial costs or benefits are evidently at the forefront of most commentators’ minds, the human element cannot be ignored. Professor David Lomas of University College London has revealed that British scientists are being passed over as applicants to EU funds, as the new ambiguous status of the UK makes the associated applications weaker. Similarly, the free movement of specialists both into and out of EU member states that the UK currently enjoys may be revoked, or more heavily sanctioned. However, some politicians have remarked that the highly-skilled workers commonly employed with scientific research are unlikely to be affected by new restrictions – immigration control being primarily for the benefit of capping mass, low-skilled migration. In addition to capping net migration, the Brexit result will likely deter some UK researchers from joining international projects. NHS Brexit: What Does This Mean for Universities? According to the British Council, EU nationals currently make up 18% of academic staff in UK universities and 14% of postgraduate research students – whilst 72% of all researchers in the UK have published abroad between 1996-2012. However, since the Brexit referendum, 2,300 EU academics have resigned from British universities in the past year. The loss of mobility will increase the time and financial cost of moving workers to the EU, and many fear that UK-based scientists will no longer have a significant hand in larger, EU-wide projects such as the regulation of new drugs. NHS Brexit: What Does This Mean For Pharmaceutical Products? 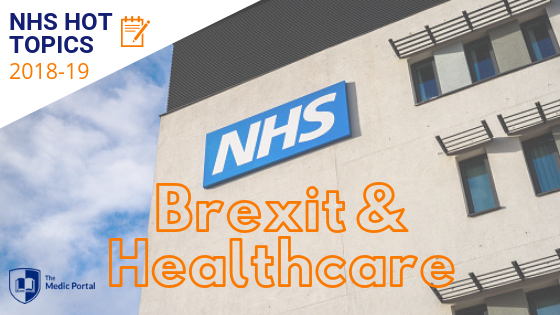 Following the implementation of Article 50 the UK medical sector will still be obliged to follow EU regulations if it wishes to sell into Europe, but it will not be able to help legislate those regulations. Other nations who are not EU members, such as Australia and the US, often have a six- to twelve-month lag phase before they are able to trade with and access the same drugs as European Union members. It is expected that the UK will experience a similar effect, but some pro-Brexit parties have pointed out that there are currently 16 associate EU members who do receive funding and support from the EU, and that Britain should pursue a similar relationship. Furthermore, when UK leaves the European Union in March 2019, the European Medical Agency has “major concerns” that if authorisation plans cannot be adapted in time, 16% of pharmaceutical products (108 out of all 694 affected) may no longer be available on the EU market. This may lead to supply disruptions to both EU countries and UK in the future. The issue of NHS Brexit has raised many questions. Brexit is one of the most defining events in UK political history, and its impact on the medical world will be huge and unprecedented. Many fear the loss of international talent and aid, whilst others eagerly await the additional control of funds and direction that the divorce bill will allow. The majority of medical practitioners and researchers condemn the decision, but they are members of only one industry that will be affected, so this is not necessarily representative of public opinion. With the exit process still underway, it will be years until we can quantify the full effect of Cameron’s referendum, but for the medical fraternity, financial, staffing, and research concerns are set to continue for a very long time. See over 100 NHS Hot Topics questions and answers in our FREE Interview Question Bank!